My Irishman gave me Paula Wolferts Moroccan cookery book for Christmas. I love love love the flavours of Morocco and have had lots of fun expanding my repertoire. 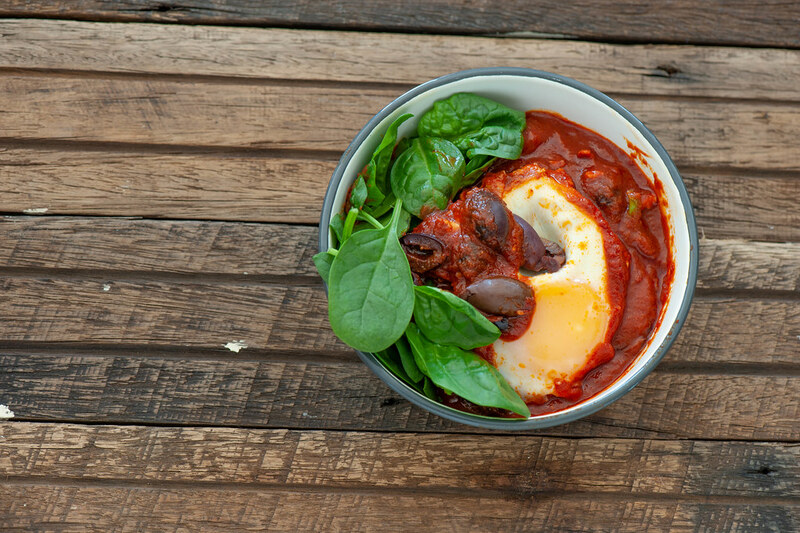 There’s a classic tajine (Moroccan stew) of kefta (meatballs) eggs and olives. I’ve been on a mission to have more eggs for dinner so I thought I’d try it without the meat. Love how the olives provide that salty flavour explosion and meaty texture. Who needs meatballs? 1. Heat a large frying pan on a medium high heat. Add a super generous glug of extra virgin olive oil and spices. Cook spices in oil for 20 seconds or until you can just smell them. Be careful not to burn. 2. Add tomato passata / puree / pasta sauce and bring to a simmer. Crack eggs into the sauce and simmer, covered for 2-3 minutes or until the egg white has set and the yolks are still runny. 3. Divide baby spinach / greens between two bowls. Top with eggs and sauce and finish with olives. Finish with a drizzle of extra virgin olive oil. WINE MATCH: A nice buttery chardonnay. Or a pot of Moroccan mint tea. more substantial (carb lovers) – couscous, rice, pita bread or cooked pasta. more substantial (low carb) – more eggs, serve with cauliflower ‘couscous’, zucchini tortillas or serve with roast almonds, goats cheese or crumbled feta. more veg – add grilled peppers, grilled zucchini, grilled eggplant, cooked mushrooms or other cooked veg to the sauce. carnivore / egg-free – chicken thigh or breast fillets (brown in pan before toasting spices and simmer until cooked through) or try this Moroccan Meatball Tajine instead. different tomatoes – a can of crushed tomatoes will work as well. 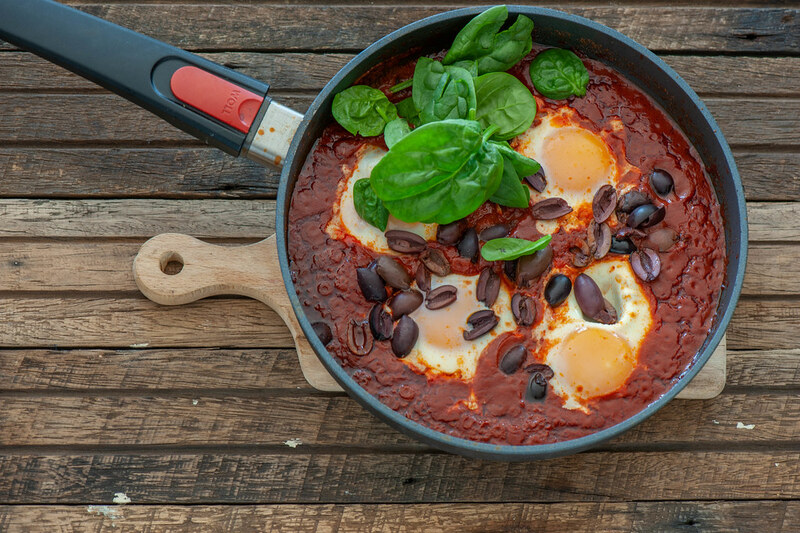 tomato-free – try this green Shakshuka instead. no olives – serve with roast almonds, pine nuts, goats cheese or crumbled feta. herby – serve with basil, mint or parsley leaves. different spices – love it with my Stonesoup secret spice. Or try ras el hanout or even curry powder. ground cumin / smoked paprika / passata / puree / pasta sauce / olives – keep them in the pantry. I prefer the eggs when freshly cooked so you get the runny yolks! Leftovers will keep in the fridge for 2 weeks. Don’t freeze.